Great doghouse. Easy to assemble and fast shipping. Excellent product. I agree with others who have suggested using square drive when you assemble, rather than phillips. This item is thought out pretty well. I like the design and have built one like it for an earlier dog. I think there is a flaw or two....it seems when I drilled into it in several places there was no wood between the inside and outside....there was no or little purchase for the screws ! The rear hinge is a little tough to get lined up and the screws into the box. There needs to be a more substantial set latch to keep the roof open when working inside the box. Let us see how it does over a winter !! Received half of the house on time. The other half was lost with UPS. Took about a week to have the other half re-shipped from the manufacturer. Had to deal with UPS myself to start the investigation on the whereabouts of the package. You guys did contact DeerCreek to have the rest re-sent. House seems to be well made. We'll see how the dog likes it. She is the one that counts!!! "Needs an insulated floor and better lid holder." Needs an insulated floor and better lid holder. 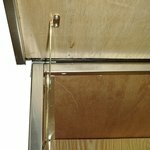 "Lifesaver Divider House" -- Removable partition to stop the worst drafts! Temporarily backordered with the manufacturer. The manufacturer does not have a set arrival date at this time. We will update our webpage once we are given a tentative arrival date. We apologize for the inconvenience. 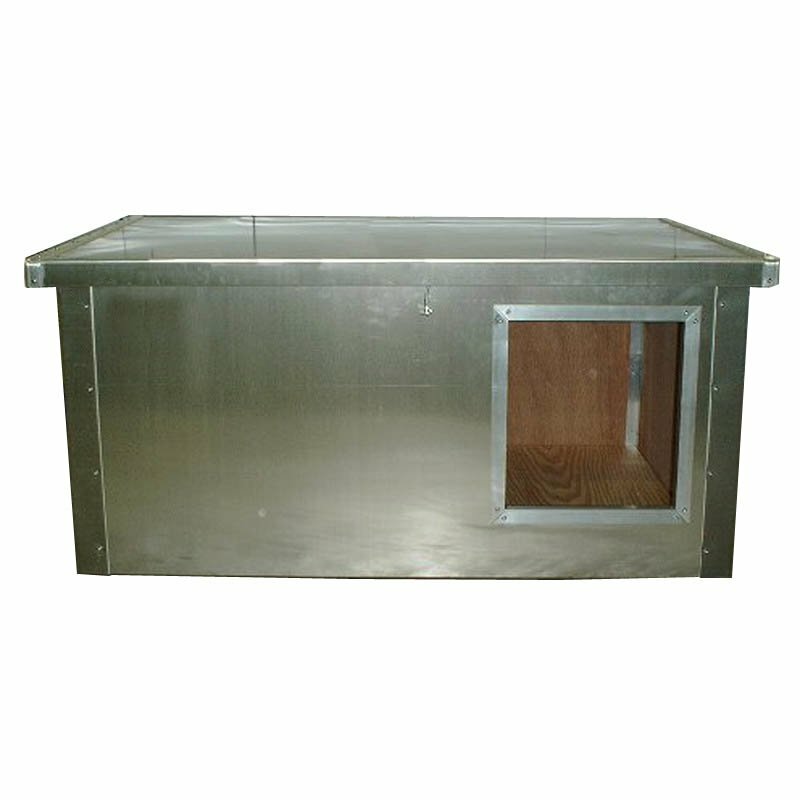 Deer Creek Business specially designed their Lifesaver Dog House Kits so they can be shipped in pre-constructed panels (sides, front and back, lid and bottom). These attach to the pre-drilled aluminum corners with the included screws. After assembly, place the house on bricks or pavers to elevate it above the ground and prevent moisture damage. For dogs up to 75 lbs. Dogs are den animals and traditionally have sought safety and security in small confined areas. Most of the time dogs prefer to be curled and butted against a wall, preferably a corner. This is why a misplaced dog is likely to be found under the family vehicle, behind the work table out in the tool shed, or flopped down in a recently excavated hole by the garage. Cathedral ceilings and wide open spaces are the preferences of humans. Most dogs are not so inclined. Keeping this in mind, how much space should a house allow for a typical dog, and how much more space is needed for larger dogs? 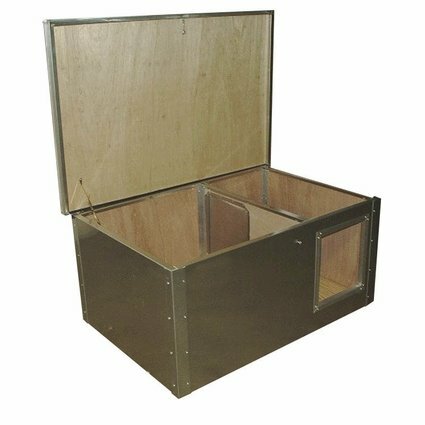 A basic area of 30" x 30", with 16 to 20 inches of ceiling height will provide your dog a den area suitable for his nesting instincts, and make it easy for him to maintain body warmth. Because your dog cannot rise within the house, he can't easily scratch or chew on the walls. Larger dogs may need more width or depth to accommodate their larger frames, but their need for overhead space does not incrementally increase. A dog house shouldn't be larger than your dog can heat. Remember, his body provides the only heat to combat the winter's cold. Peaked or domed roofs can draw heat away from your dog and help create drafts. 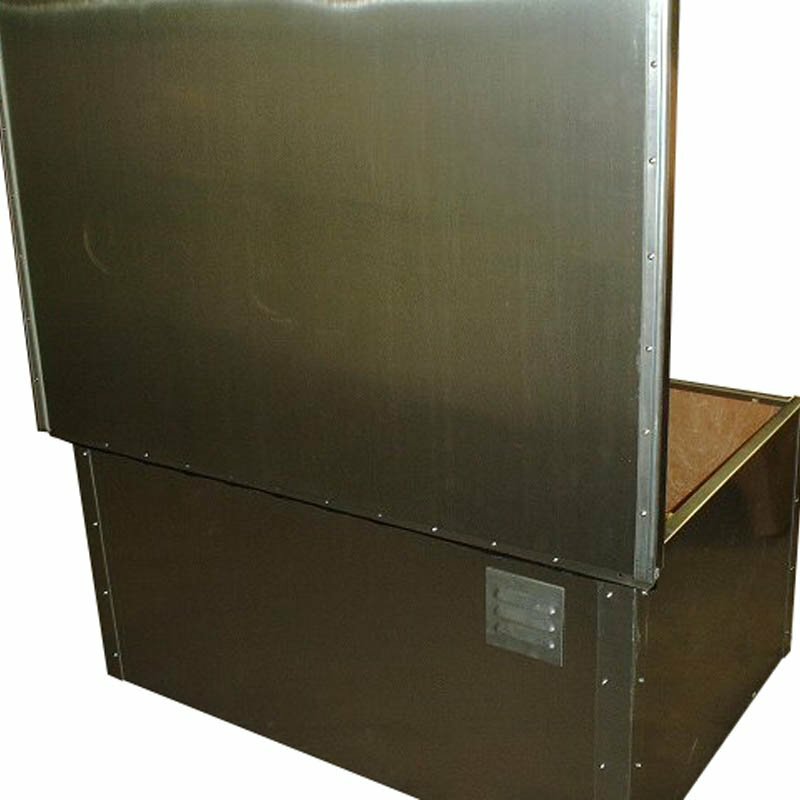 For areas with extreme cold weather, the Deer Creek Business Divider House with double compartment and removable divider stops even the worst drafts. Tests have proven the Lifesaver dog house stays cooler in summer, too. The double wall construction with insulation helps discourage moisture and seals out heat. 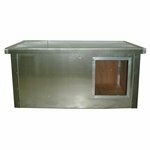 The Lifesaver Dog House is built and designed to provide your dog with a dry environment and wind protection. The house is constructed with 1 x 2 frames, sandwiched on both sides with 2.7 mm lauan, a veneered wood material used in home building for doors and cabinets. The lauan interior wicks moisture away from your dog and is draft resistant. There is no plastic to chew on or trap moisture or condensation, and no metal inside to collect moisture and freeze to your dog's coat. Between the lauan is 3/4" EPS type foam board insulation. 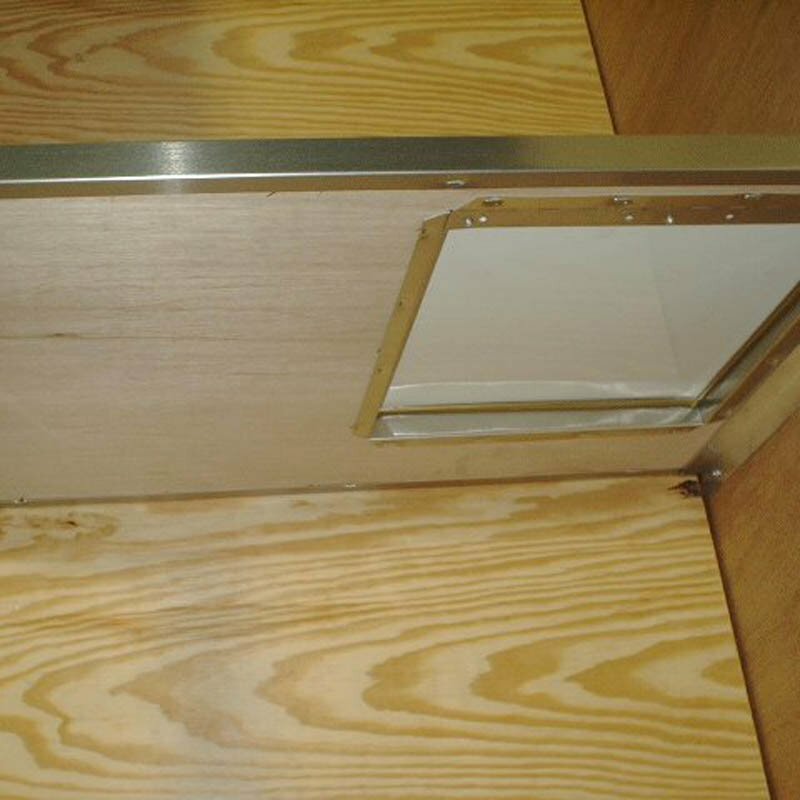 The 1/2" plywood floor is positioned 5 inches lower than the bottom of the door opening to allow plenty of bedding for nesting. The outside of the doghouse is covered in aluminum sheeting. The lid is engineered and sealed to be leak proof. 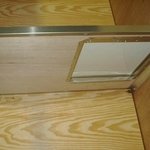 It allows full access to interior for cleaning, bedding changes, and dog handling, and includes a lock-in-place support bracket. 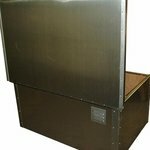 An aluminum double swing weather flap allows easy access for your dog. 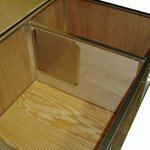 11 3/4" W x 13" H door opening. Step 1: Position one of the side walls to the back wall, painted wood sides to the inside and metal lip for the floor on bottom. Square up the walls (using the rubber mallet if desired) making sure all the edges are flush with one another. 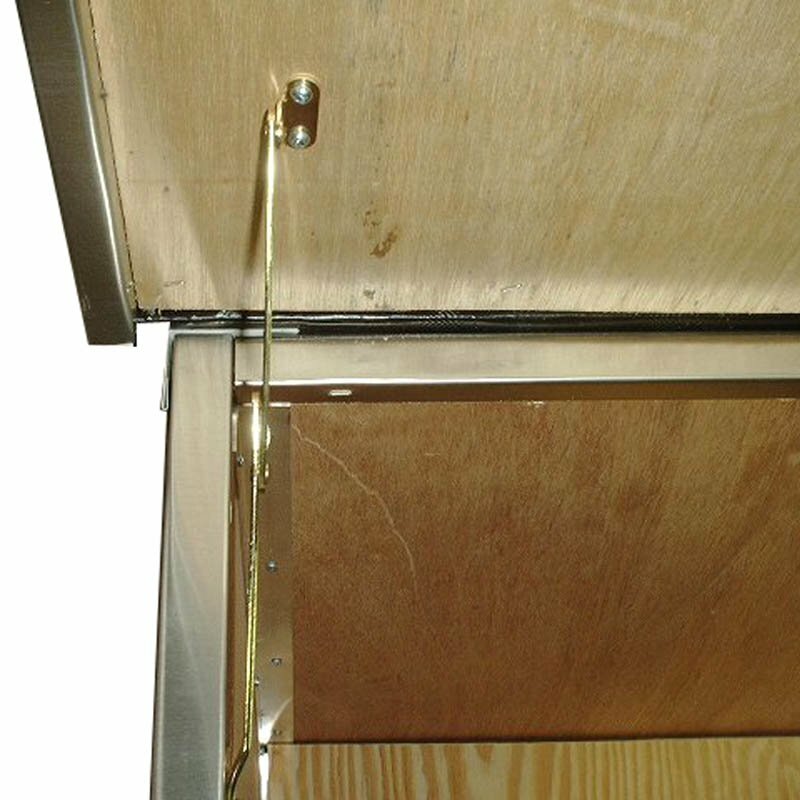 Working from the inside, secure the walls by inserting a 3/4" flat head screw through the top and bottom pre-drilled holes on the interior aluminum corner bracket. Step 2: Repeat Step 1 with the other side wall. Step 3: Slide front wall into place, square up, and secure with 3/4" flat head screws. Insert all remaining screws into the interior pre-drilled holes again using 3/4" flathead screws. Step 4: Insert 1" round head screws in all remaining exterior pre-drilled holes on the house. Step 5: Drop the floor panel down into the 4 wall configuration until it rests upon the metal lip along the bottom edges of the walls. Step 5A (Divider House only): Using the 4 pieces of aluminum angle, take a piece holding rounded angle up, squared corner side against house, and fasten to house interior, flush with the left side (as you are facing the house) of the entrance door. This is screwed in at the mid top and mid bottom. Measure the distance of this installation and do the same at the back of the house. 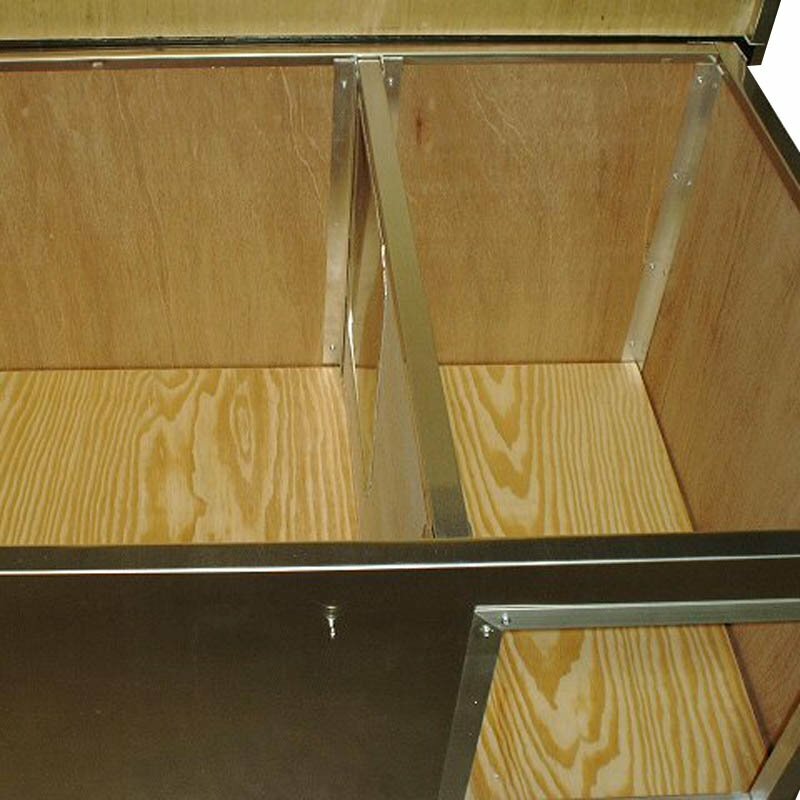 Step 5B (Divider House only): Once this is finished, place the divider against the bracket and measure where the other side of the bracket needs to be. Screw the squared corner side of the second piece of angle bracket to the house interior at the front and the back. If it is easier, you can mark the placement, remove the divider, then re-install it once the bracket is in place. Step 6: Center the lid (aluminum side up) on the top of the dog house making sure the hinge is flush against the house. 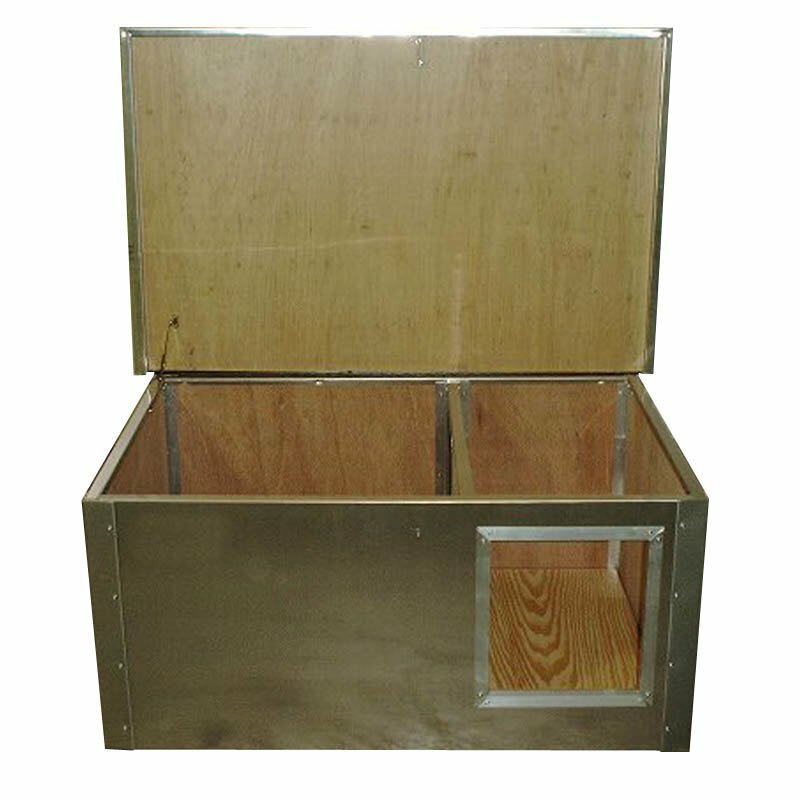 The hinge may be placed on the front or back depending on your personal preference and kennel needs. Fasten the hinge using the 1" round head screws. The lid will overlap the house on the sides & non-hinged side which insures a weather resistant interior. Step 7: With the lid opened and supported, as you face the house, fasten the lid support bracket to the interior left side wall. Place the bracket about 1" down and 7" from the back on the side wall and attach using the 3/4" flathead screws. 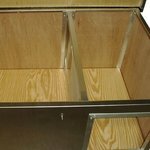 Now lift the lid to its full upright position, place the bracket against the lid, and secure in place with 3/4" flat head screws. Step 8: Determine the placement of the eye and hook assembly. 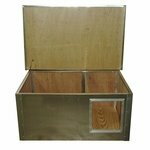 Place the lid in the closed position and use a felt tip pen to mark a spot on the underside of the lid on the wood surface (not the metal surface). Open the lid and screw the hook into place. Close the lid and screw the eye into the correct position on the house. With proper cleaning and appropriate bedding, your house will last you and your dog for many seasons to come. The outside surfaces are aluminum painted and non-painted materials. Rubbing compounds and typical auto waxes are not recommended. The paints used on the aluminum surfaces are too soft and will leave swirls. Deer Creek Business recommends using warm water and a liquid dishwashing soap to clean the outside surfaces. A spritz of windex type liquid afterwards will bring a shine and luster back to the product. Bleach and like cleansers are not recommended. They are reactive with aluminum and will corrode it. If dogs urinate on the interior or exterior, clean regularly to avoid corrosion. The interior of the box may be cleaned with garden hose type applications, soap and water. Leave the box open and available to dry. Some owners choose to drill drainage holes in the floors, but tipping the box over and allowing it to drip dry works every bit as well. Wood sealants are also not recommended as they will corrode the aluminum.